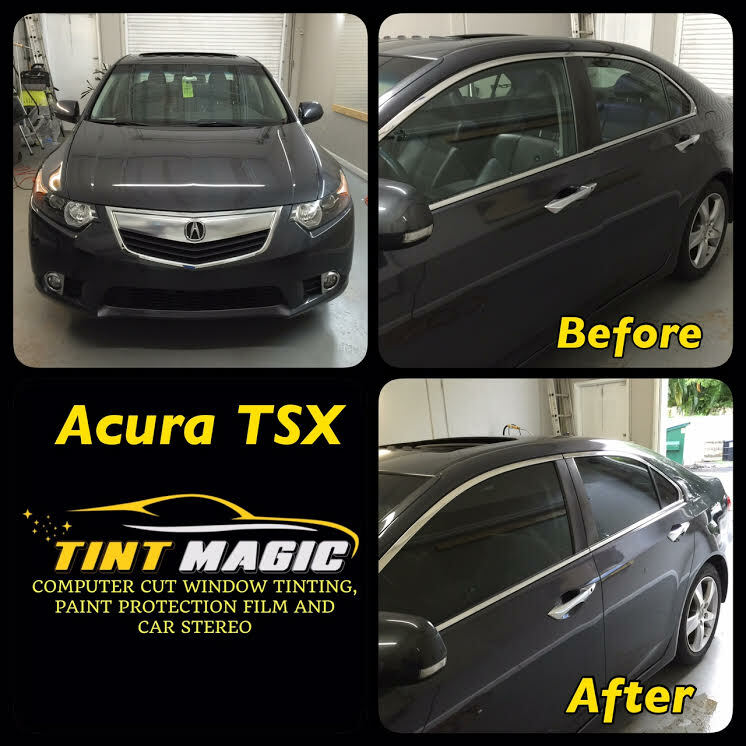 Acura TSX at Tint Magic Window Tinting Coral Springs. We use computerized cutting system to pre-cut window tint before placing it on glass. We offer Lifetime Warranty in almost all packages. Call us for a free estimate! (954) 840-7883. Find Us: www.tintmagic.net. Based on the Euro-market Accord, the TSX fills the niche between Acura’s smaller Civic-based ILX and larger U.S. Accord-based TL. It’s a bit roomier and more fun to drive than the former while offering a wagon body style that’s not available on the latter—or any other Acura. The sedan’s 2.4-liter four-cylinder can be linked to a six-speed manual or five-speed sequential shift automatic. Stepping up to the available 3.5-liter V-6 boosts performance yet pushes the TSX into TL’s price territory. With the TSX, Acura realized the premium segment was getting smaller. In 2004, the brand began importing the European version of the Honda Accord, reskinned with Acura details, to sell as the TSX. The trim TSX already had the larger Acura TL and RL sedans offering V-6 engines, so Honda decided the smallest Acura four-door would be fine with a four-cylinder only in that first generation, from 2004-2008. Enthusiasts loved the package. The 200-horsepower 2.4-liter four-cylinder engine teamed with either a five-speed automatic or a six-speed manual gearbox and routed power to the front wheels. Though it looked a bit anodyne and basic, this TSX handled very well and accelerated nearly as quickly as the larger V-6-powered TL, thanks to its lower curb weight. Inside, the TSX had somewhat tight interior dimensions, but a raft of luxury add-ons included satellite radio, leather seating and a sunroof–which you could also get with the somewhat less expensive, and more roomy, American-market Honda Accord. The TSX remained almost a cult car through this first generation, earning good reviews and good crash-test results for frontal impacts, too, but side-impact crash protection didn’t score quite as well. Over time, the engine found 5 horsepower for a total of 205 hp, and Bluetooth became standard.